Happy rainy Monday! The kids in our district are stuck home for another "snow day" but it's just pouring! I will feel really bad for them when it's the third week of June and they're still in school...ick. Anyhow, it's Monday so you know that means it's time for my confessions! 1. I confess I have some exciting Emily Troutman Photo news coming in the next day or so about a February special I am running! 4. I got to photograph my first wedding of 2014 on Saturday and it was beautiful! I am excited to get back into photographing as the season picks up. 5. For any of you that are like "has she seriously lost her mind?! She's photographing, teaching and added another thing to her plate by coaching...." I am a little crazy I know. I am just taking it one day at a time. Thankfully things have seasons, ebbs and flows. I feel like this season of my life is figuring out lots about motherhood and what else I am called to do. I love all of these things and am passionate about them. I am just taking it one day at a time my friends to seek out what God has for me! 6. My kids won't stop singing "Let it go" at the top of their lungs! It's the song from the Frozen soundtrack if you aren't familliar with it. 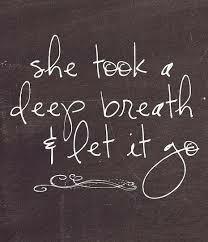 I have to say though, it's some sage advice....whatever it is, let it go! Ok friends, off to the doc for a follow up appointment for one of my kiddos! I am still fighting sickness as well. Seriously ready for spring on so many levels!!! Have a great week!